Ultimate Edition of IntelliJ IDEA provides an additional way of inspecting the project structure — the diagram of module dependencies. To open it just press Ctrl+Alt+Shift+U or invoke Diagrams | Show Diagram from the context menu on a module node in Project View or Navigation Bar. 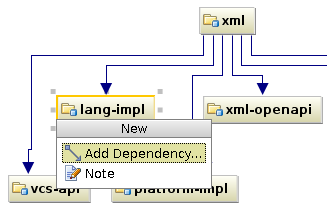 IntelliJ IDEA 11 adds the ability to edit module dependencies using the diagram: press Delete on an edge to remove dependency or press Alt+Insert to add a new one. Your feedback is very welcome, as usual. This entry was posted in New Features and tagged Nika, UML. Bookmark the permalink. Will underlying project structures like Maven pom filesbe adapted as well? no, this feature works on IDEA project model only. need to also add the reverse mode: who depends on this module.